ANAHEIM, Calif., —Tone Software Corporation, a leading provider of comprehensive voice quality and unified communications monitoring and management software for converged telecommunications networks and IT infrastructures, today announced its ReliaTel® VoIP and Unified Communications (UC) Service Assurance software is providing a telephony management platform for the IT Outsourcing (ITO) managed services business of Xerox. The Xerox ITO team applies the ReliaTel technology and other third-party services to expand its visibility into clients’ voice network performance, capacity trends, and service levels to improve its service delivery. Delivering IT outsourcing services to many of the world’s largest organizations, Xerox designs, develops, and delivers managed services to help organizations simplify their business operations. 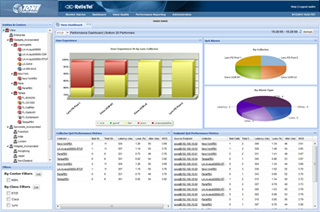 As clients increasingly turn to Xerox to manage VoIP, UC, and converged voice networks, the Xerox team utilizes ReliaTel from Tone Software as a tool to provide proactive monitoring, traffic and capacity trending reports, as well as the essential diagnostic data needed to intercept and resolve performance and quality issues in their clients’ environments before they become serious user-reported problems. John Truetken, director of Network Architecture for the Xerox ITO group, said the impact to the Xerox delivery process has been positive. As more businesses incorporate advanced VoIP and Unified Communications technologies into their business operations, the Xerox voice team is now instrumental in managing its clients’ IPT quality and UC network performance using the ReliaTel VoIP QoS management facilities. “ReliaTel is helpful in the diagnostics of pinpointing where problems are occurring, and also giving us visibility when a problem is starting to happen. This allows the Xerox team to foresee a problem developing, so we can address it,” said Truetken. Xerox states ReliaTel helps them be more proactive and anticipate potential performance and quality issues before clients are affected. With an expansive client base and thousands of client devices under management, the Xerox team also reports that one of the key benefits ReliaTel has brought to Xerox is reducing their higher severity trouble tickets, particularly those occurring during off hours. As an active participant in educational events, Tone Software presented a conference session on Unified Communications technology at the International Avaya Users Group (IAUG) Converge2014 conference located in Dallas, TX. this past April. The session, entitled “Taking the Chaos out of Collaboration – Building a Durable Lync UC Ecosystem” was presented by Tone’s director of UC Strategies, Paul Wiggins, who also participated in an IAUG Spotlight panel entitled “Focus on Lync Integration”. Tone also exhibited at the IAUG Solutions Expo in booth 318. For more information on IAUG visit www.iaug.org. Tone Software Corporation is a global provider of comprehensive monitoring and management solutions for converged telecommunications and IT infrastructures. Tone’s ReliaTel solutions provide managed service providers, value added resellers (VARs) and enterprises with a unified approach for managing and monitoring their entire communications infrastructure, supporting the industry’s leading devices, networks and environments from multiple vendors on multiple platforms. By unifying multi-vendor VoIP QoS and UC management in one solution, ReliaTel provides the ideal platform for organizations that must cost effectively manage the quality, capacity and service levels of the critical communications systems that drive their business. Follow Tone on Facebook or Twitter.